The Town Council’s Community Youth Partnership is consulting on a potential project to provide youth facilities at Loddon Mead in Woodley. The Community Youth Partnership has produced a video inviting young people to make suggestions for activities that could be provided in the area called Loddon Mead (on Loddon Bridge Road) and the area next to it under the A3290. The partnership, made up of representatives from organisations working with young people, have been discussing uses for this area with young people in mind and would like to hear your views on suitable activities. 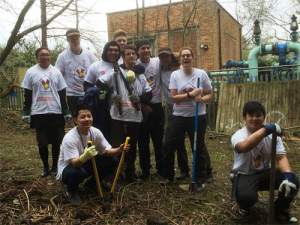 Our grateful thanks go to McDonalds Reading area volunteers who spent a wet and cold week in April helping clear the overgrown areas at Loddon Mead open space. Thank you too to Just Around the Corner youth charity who organised and worked with the volunteers.